I’ve been very active on our nature strip, madly guerilla gardening in several citrus trees, a bay tree, kaffir lime, and lemon-scented tea tree. My next step is to progressively get rid of the grass which is competing with the trees (no small task, will be waiting for some cooler weather!). One of the residents from down the road dropped by one day to ask about the trees: did I ask for permission from the Council first? “Well, I could’ve” was my response. 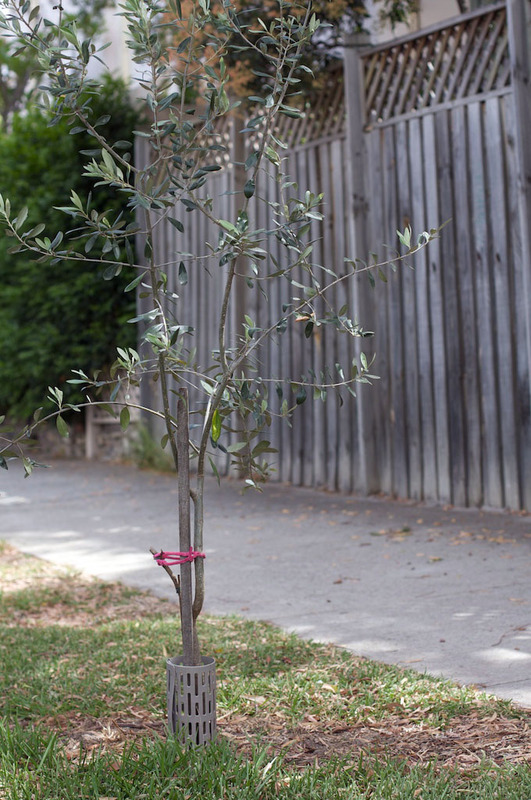 After some further discussions, he revealed that he had two olive trees that had outgrown their pots, and was wondering whether they could be planted into the nature strip in front of their house. I said: why not! The following weekend they went into the nature strip, and they’re growing well a month or two later. This entry was posted in Guerrilla gardening and tagged guerilla gardening, nature strip, olives. Our plan has generally been to put things into the nature strip that provide edible leaves, rather than fruit. That way the plants should be better able to withstand the local (encouraged) harvesting. The bay tree was an obvious choice. Then the topic of kaffir limes came up in conversation with our next door neighbours, and we knew what had to go in next! A few weekends ago we sourced one from a local nursery, dug a deep hole into the clay soil, and bedded the tree into a whole bag of cow manure. This entry was posted in Growing our own food, Guerrilla gardening and tagged Guerrilla gardening, kaffir lime, nature strip.